With the scalable SAMBA Series concept, Cevotec extends the possibilities of Fiber Patch Placement. With SAMBA Scale, SAMBA Pro and SAMBA Step, equipment options are available for series production with 100 kg fiber throughput per hour as well as cost-effective prototyping. The modular production system attracted much attention at Composites Europe Stuttgart (September 19 – 21). “Fiber Patch Placement for series production of complex preforms yields a new level of automation and material efficiency that conventional lay-up processes cannot provide,” states Thorsten Groene, Managing Director of Cevotec. Lay-up processes with a high material throughput usually produce 2D preforms, which then are formed to shape in press. This is an additional production step and causes additional costs. On the other end, 3D printers produce complex, filigree geometries without additional forming steps, but have a low material throughput and long production cycles. With Fiber Patch Placement, complex-shaped 3D preforms are created in a single automated process without additional forming, using about 30% less material than conventional technologies. In the easy-to-use digital design process, the load-oriented fiber laminate, including locally-adjusted thicknesses if required, are specified. The finished parts are characterized by a stiffness and strength that is up to 150% above those of classically manufactured components. 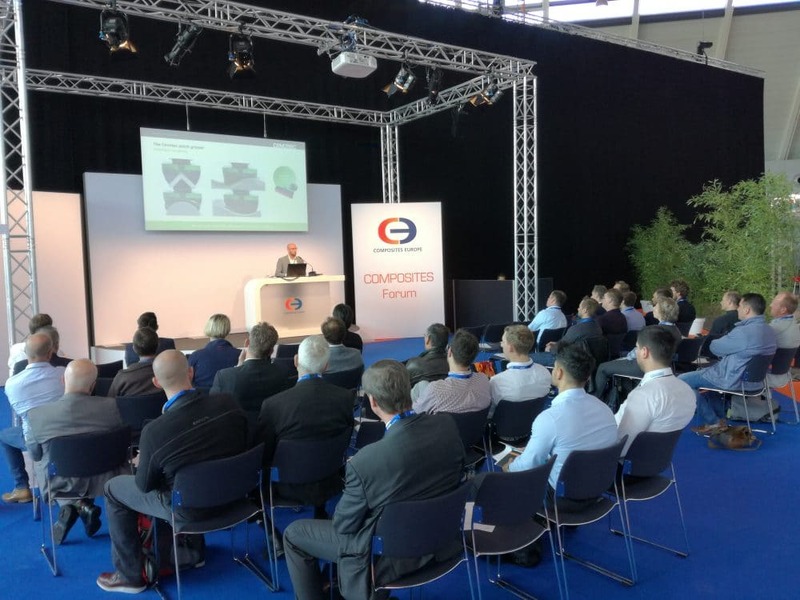 At Composites Europe in Stuttgart, the rapid, continuous development of the Fiber Patch Placement technology were among the audience magnets. The next opportunity to meet Cevotec personally and first-hand information about the technology will be the GoCarbon Fiber Conference from October 10 to 12 in Munich. At the end of the year, Cevotec will also be present at the Composites and Advanced Materials Exposition (CAMX) in Orlando, Florida (December 11-14). Cevotec offers smart production technology for fiber composites based on Fiber Patch Placement technology, enabling manufacturers to build complex parts fully automated in high volumes and quality. SAMBA is Cevotec’s high-tech preforming system for challenging 3D geometries and laminates with complex fiber orientation. With ARTIST STUDIO, Cevotec provides the matching CAD-CAM software platform and, in addition, offers development services for prototypes and series products. Cevotec is a spin-off from Technische Universität München and partners with Airbus Group, Baumann Automation and the European Space Agency ESA to industrialize the production of complex composites.